Since the EU and UK presented a (partially) agreed draft version of the Withdrawal Agreement (WA) in March 2018, many seem to assume that the post-Brexit status of the more than 3 million EU27 citizens in the UK (and more than a million British citizens in the EU) is resolved. The EU has indeed made an important effort to define and obtain a status for those citizens that comes close to their current rights. However, the debate has particularly focused on the material scope of these rights, rather than on the process through which people will be recognised entitlement of those rights. In fact, many people who have been legally in the UK for years or decades are at risk of failing to prove their entitlement to remain once the UK has left the EU. The key problem is that the Withdrawal Agreement is built on a flawed premise. It assumes that by copying the criteria of Directive 2004/38/EC (the Citizens Directive) relating to the acquisition of residence rights, EU27 citizens will be guaranteed the same status as they hold today. In a nutshell, in order to obtain residence rights provided by the Directive, one needs to be in work (or have been in work), or show to have sufficient resources and comprehensive sickness insurance. There is a level of discretion for the Member States on whether and to what extent they impose and control these criteria. However, applying these criteria will operate very differently once the UK leaves the EU than when it was still an EU member. First, after Brexit EU citizens in the UK will no longer be protected by all judicial remedies provided under EU law. The infringement procedure will no longer apply. Neither can Francovich damages be asked for in the national court. There are still doubts on how exactly the UK will ensure respect of direct effect of the WA’s citizens provisions; and one can question to what extent UK courts will make use of the time-limited option to ask preliminary references. Courts have a considerable discretion in this, and one wonders to what extent judges will feel inclined to make use of it once the UK is no longer part of the EU. The UK has already shown bad implementation of the Citizens Directive (for instance in relation to Comprehensive Sickness Insurance) even as a Member State of the EU. Without the full protection of the EU judicial system, correct enforcement of the Directive and the WA post-Brexit will become even more problematic. Secondly, once the UK withdraws from the EU, the criteria of the Citizens Directive will be applied in a constitutive rather than a declaratory registration system. Under a constitutive system people have to successfully apply in order to obtain a residence status. In case of rejection, an applicant will have no document certifying their status; as a result they will lose all entitlements and ultimately face deportation. The consequences of not obtaining a ‘settled status’ document are thus far more serious than not obtaining a permanent residence card under EU law. In a declaratory system, absence of a document does not mean that you are not entitled. Even if your application is rejected you might still be able to stay on a temporary basis, or might be able to return under free movement provisions. The consequences of a constitutive registration system can be particularly dire if combined with the UK’s so-called ‘hostile environment’ policy on immigration. Thirdly, applying the criteria of the Citizens Directive within a constitutive system is particularly problematic in the UK context because the country never registered EU citizens upon arrival. Requiring citizens who for example may have lived in the UK for decades to retrospectively prove their legal status may prove highly problematic in many cases. The recent Windrush scandal exemplifies the dramatic consequences of such an approach. Finally, the sheer number of people to be registered within a short period of time makes a rigid application of the Citizens Directive practically impossible and undesirable. This has also been recognised by the UK Government. The UK’s implementation of the EU permanent residence registration procedure has a current rejection rate of 28%. If a similar interpretation of the Directive criteria and registration was to be applied to more than three million EU citizens, this could have disastrous consequences. It is, therefore, rather shocking that the EU has agreed a WA that simply copies the Directive criteria, pretending that all those currently profiting from EU free movement rights in the UK would still be protected after Brexit, and underestimating the particular challenges of applying these criteria in a very different context. The UK Government itself has stated that a rigid application of the criteria is both impossible and undesirable. Thus it has promised that it would not apply the criteria of Comprehensive Sickness Insurance (CSI) and ‘genuine and effective work’ and that it would instead introduce a simple registration system based on proof of identity, residence and criminality checks. But, these are merely political statements. The Government can change its position at any time, possibly introducing a registration system not dissimilar from the current procedure for permanent residence applications, with that difference that after Brexit the procedure would be constitutive in nature. This would mean that about 28% of 3 million EU citizens would immediately face the hard consequences of the UK’s ‘hostile environment’ and be threatened with deportation. So why has the EU not made more effort to ensure the UK’s political statements would be turned into legal commitments and thus avoid such a scenario? The European Commission has taken a formalistic approach arguing that EU citizens retain the same entitlements as under the EU Citizens’ Directive, and thus pretending they are not at risk. However, that fails to acknowledge that these criteria cannot operate in the same way when they are applied in a country that never had registration and will introduce a constitutive registration system when it is no longer a Member of the EU. The refusal to accept this reasoning seems to be inspired by the fear that writing more details into the WA on a simpler registration system in the UK would put the other 27 Member States under pressure to apply a similar procedure, and thus de facto undermine the discretion allowed by the Citizens’ Directive. However, the WA is an international treaty. It can set particular provisions for the UK (as, in fact, it does on other issues, such as requiring an independent authority to be set up in the UK), and this approach would be justified by the fact that the legal situation in a country out of the EU is not identical to that of countries in the EU. Hence, legally this can be done within the WA without imposing new requirements on the other 27 Member States. Nevertheless, if there is political reluctance by the remaining Member States, an alternative solution is to set out the UK’s political statements regarding a simple registration based merely on residence, ID and criminality check into a Protocol attached to the WA. A Protocol would not change the main text of the WA, but simply set out legally the political promises the UK has made with regard to how it will implement the WA. The aim of adopting a Protocol is to make these unilateral commitments by the UK legally binding at the international level. This is because a Protocol has the same legally binding force as an international treaty like the WA. Protocols can set out further details, often signed by and applicable to only some parties to the main international treaty. Given that the Brexit withdrawal negotiations are based on the principle ‘nothing is agreed until everything is agreed’, such a revision of the WA or the inclusion of a Protocol specific for the UK is still possible. Whether this is politically achievable depends on several actors. It is not clear to what extent the formalistic approach of the European Commission was really inspired by substantive resistance from the Member States. The negotiation has been strongly driven by the European Commission, within a very short time frame, leaving the Member States little time to get through the nitty-gritty complex citizens’ rights provisions of the WA. Whether the UK is ready to agree to such a revision of the WA or to signing up to a separate Protocol depends on bargaining power in the negotiations. From its perspective, it comes down to setting out legally a commitment it had already made politically, but it might be very reluctant to do so at an international level. Yet, the UK government may be willing to do so if the EU offered freedom of movement throughout the entire EU for the British citizens already residing in Europe, which remains the biggest weakness of the WA for this group. The European Parliament might be the ultimate dealmaker on this issue. It has presented itself as the big defender of citizens’ rights in the Brexit negotiations and has repeatedly stated it will not approve the WA if it has no guarantees on their protection. Yet, to defend EU citizens properly it has to realise that the key issue is no longer whether the WA copies all rights of the citizens’ Directive, including the right of residence for a third country spouse, but whether it provides procedural guarantees on the registration system that take into account the particular challenges of the UK post-Brexit. 1) The UK Government has committed to a procedure that will be simple and based on ‘residence, identity, and criminality check’. It has repeatedly stated that it will neither require proof of Comprehensive Sickness Insurance, nor of ‘genuine and effective work’. The latter implies that the UK will not apply any means testing in its registration procedure. Under EU law, means testing is only possible if one fails the test of ‘genuine and effective work’. Hence, if the UK were to introduce means testing without a preceding test of ‘genuine and effective work’, it would be in breach of EU law and the commitments of the Withdrawal Agreement. 2) The WA allows for the creation of either a constitutive or a declaratory registration system. The UK Government has stated it will introduce a constitutive registration system. As it is politically highly unlikely that the UK could be persuaded to accept a declaratory system, or to revise the WA in that direction, this proposal for a Protocol is based on the premise that a constitutive system will be introduced. As the exact way the UK intends to implement the UK is not yet clear, this proposal for a Protocol cannot be read as a full legal translation of the UK’s intentions. Moreover, I have included some provisions necessary to protect EU citizens’ rights but that go beyond what the UK Government has promised in its political statements. b) fully incorporate the provisions of Part II of the WA, and in particular the detailed provisions of the registration procedure as set out in Article 2 of this Protocol. The Joint Report promised that the Withdrawal Agreement and Implementation Bill will ensure direct effect, but at the same time it required for the citizens’ rights provisions of the Withdrawal Agreement to be fully incorporated in that Bill. This provides a double guarantee; namely a supranational guarantee via direct effect and protection via primary legislation to avoid that citizens’ rights provisions are set out in ever- changing and difficult-to-monitor acts of secondary legislation. Unfortunately, the WA is less clear in this regard. This Article 1 of the Protocol clarifies the interpretation of Article 4 WA, so it is in line with the promises made in the Joint Report. As the UK will be no longer part of the EU judicial system, the tool of direct effect on its own, independent of other features of that system, will not be sufficient to guarantee EU citizens their rights. Hence, it is also necessary for their rights to be set out in primary legislation. In particular where the Withdrawal Agreement leaves discretion to the Host State (such as on the application of Article 17WA), the UK should make its key choices of implementation via primary legislation setting out the main applicable rules in the Withdrawal Agreement and Implementation Bill and not delegate this discretion to secondary legislation. This does not mean that certain administrative implementation measures cannot be delegated to affirmative secondary legislation, but the key features as set out in this Protocol should be set out in primary legislation. 1. The United Kingdom will require EU nationals, their respective family members and other persons, residing in its territory in accordance with the conditions set out in Part II, Title II, to apply for residence status which confers the rights under this Title and a physical document evidencing such status. The application procedure shall comply with the conditions set out in Article 17. This first paragraph confirms that the UK registration procedure will comply with all the provisions of Article 17 WA. It commits the UK to providing a physical document as proof of status. The WA allows for only a digital document. 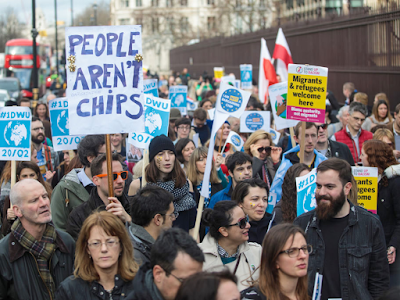 In light of the UK’s 'hostile environment' to immigration (which requires private actors such as banks, employers and landlords to check on the status of immigrants) a digital document will not be sufficient protection for those benefiting from the WA. Ideally, the WA itself needs to be amended on this issue, as it is equally a potential problem for British Citizens wishing to benefit from the WA in Europe. 2. Making a statement on residence. This will then prompt the Home Office to confirm the validity of the ID and check their and other government agencies existing databases that those applying meet the relevant residence criteria. For many (potentially most) the process should be concluded at this stage. Only if the Home Office has no confirming information, it will ask for additional information, as set out in the next paragraph. a) identity: by presentation of the identity card or passport. In respect of Article 17,1(i) the administration shall return that document upon application without delay and before the decision on the application is taken. (i) For temporary residence application, one document showing residence in the last year before the application. As required by the WA the evidence must show residence by the last day of the transition period. • Letters or other documents from government departments or agencies, for example HM Revenue and Customs, Department for Work and Pensions, DVLA, TV Licensing. This list is just an example. The objective is not to set out an exhaustive list in the Protocol. However, ideally, a non-exhaustive list could be outlined in the Protocol and in the Withdrawal Agreement and Implementation Bill (WAIB), while a full list could be set out by delegated legislation (ideally with the affirmative procedure). Yet, the decision on such delegation would be taken in the WAIB and not in the Protocol. (ii) Applicants applying for settled status relying on 5 years continuous residence; one document from the list provided in 3(b)(i) above, for each year in any period of five successive years. The five documents can span a period of six years if the applicant has been absent for less than one full year. (iii) Applicants falling under Article 17 Directive 2004/38/EC are required to present one document for each year of their shorter qualification period. Additionally, one has to provide one document of this list showing residence within the year preceding the application, and at the latest at the last day of the transition period, in order to prove continuity of residence. They have to provide evidence of being entitled to the shorter qualification period provided by Article 17 Directive 2004/38EC. In respect of Article 7,1(j) supporting documents other than identity documents may be submitted in copy. Originals of supporting document can be required only in specific cases where there is a reasonable doubt as to the authenticity of the supporting documents submitted. This explains how the UK will apply criteria in relation to settled status, in respect of the WA and Directive 2004/38. Please note Article 16(3) of the Directive provides that permanent residence may not be obtained in the case of absence for an uninterrupted period of six months during the five years, but extends this to one year in some cases like pregnancy. The system proposed here in this Protocol allows maximum one year of absence during the five-year period. To avoid overload of the application procedure it does not require proof of continuity of residence other than proof of continuing residence short (one year) before application. There is no requirement to prove that one has not been absent for more than two years since building up the five years. This will particularly facilitate registration for those who do not have access to online registration. Such applications can be online, via passport service or via postal application. Applications can be made joint with the EU citizen to whom they are family member. The application for family members is by providing proof of identity and relationship to EU citizen who is entitled under the WA. Documents are those as accepted in Article 17 WA. 6. The UK Government can apply criminality checks at the time of application in respect of Article 17(1)(p) of the Withdrawal Agreement, and in respect of Directive 2004/38/EC as set out in Article 18(1) of the Withdrawal Agreement. EU citizens and their family members will not be asked to declare criminal convictions. Article 17(1)(p) allows host states to ask applicants for a self-declaration. However, this is hugely problematic and not required. Countries can check criminality anyway without applicants needing to make such declaration. Self-declaration is mainly a trap so people who declare wrongly their criminal past, deliberately or unknowingly, can be sanctioned and deported on this basis. The issue is particularly salient as the UK has shown clear intentions to use criminality checks as a key selection tool and there are examples of current practice on this matter already in breach of EU law. While enforcement of EU law has already proven difficult in the UK, it will be even more so post Brexit. Hence in order to properly protect EU citizens it is necessary to make clear such self-declaration will not be applied. This can be done either in the Protocol or by changing the WA on this. The latter would be preferable as it will also provide protection for British citizens in the EU. 7. EU citizens and their family members who have not successfully applied by the end of the grace period will not be deprived of the rights Part II of the Withdrawal Agreement confers without being previously contacted by the UK authorities with a request to apply following the procedure set out in paragraphs 2 to 4 of this Protocol. Some vulnerable people might not have applied prior to the end of the grace period because they have not been properly informed or did not know how to apply. Not holding a document to ascertain their status is likely to cause these people problems in accessing services, particularly in the context of the hostile environment policy. However, these vulnerable people should be protected from being hit by all the punitive measures of the hostile environment. They should not be deprived of the rights they may hold under the WA, without been given a chance to prove their status at the moment their lack of registration emerges. 8. EU citizens who have obtained settled status hold this status for life, with exception of the situations provided in Articles 14(3) and 18 of the Withdrawal Agreement. People who have lost their document evidencing their status will be provided with a new document simply on the basis of proof of identity, with respect of conditions as set out in Article 17. They will not be asked to provide again the original documentation at the basis of their status. Neither will they be asked to provide new proof. The same applies in case the document confirming settled status is subject to renewal. Such renewal will neither require the original documentation nor new evidence, but will simply be delivered by proof of identity. Article 14(3) WA states that settled status can be lost after five years of absence. Article 18 WA allows deportation for criminality on grounds beyond Directive 2004/38 for acts post transition. Only an indefinite right to return and deportation on grounds as defined by the Directive will ensure that EU citizens hold a status that equals their current status. This would require amending the text of the draft Withdrawal Agreement. However, independently of whether the WA is revised, it is important to make clear that loss of the document or renewal of settled status should not be abused as a way to undermine EU citizens’ established rights. Unfortunately, current UK immigration law practice provides multiple examples of situations where people are asked to provide evidence all over again when documents are due to be renewed or have been lost. If applied to settled status, this would mean that people are never certain of their status, and will remain in a permanent situation of having to prove their entitlement for the rest of their life. 9. Article 17 (1)(e) will be implemented in compliance with the General Data Protection Regulation. Article 17(1)(e) requires a transparent procedure. The UK has just introduced an exemption on data protection in immigration related matters. This bluntly undermines the data protection rights provided by the GDPR and puts EU citizens at risk of not being able to fight judicially measures taken against them by the Home Office. The Protocol should make clear that the GDPR will be respected in relation to the implementation of the WA. Many of the dangers identified in relation to a constitutive system also apply to UK residents in France if France chooses to use this system, since France also hasn't required registration of EU Citizens since 2004.